1. Buyer-Supplier Meetings: In support of the localisation objective of the SA Automotive Masterplan, the pre-arranged Buyer-Supplier meeting programme will provide opportunities for suppliers to engage with customers (existing and potential) around localisation opportunities. (270+ already currently being arranged). 2. Localisation exhibition: The localisation exhibition of estimated 1 000+ OEM and Tier 1 parts earmarked for localisation is an excellent business opportunity for Tier 1, Tier 2, Tier 3 and aspirant suppliers to the automotive industry. 3. Exhibition: The exhibition showcases the product, service and process technology offerings of 200+ firms that operate within the local automotive manufacturing value chain. All major stakeholders in the manufacturing value chain are anticipated to be in attendance. 4. 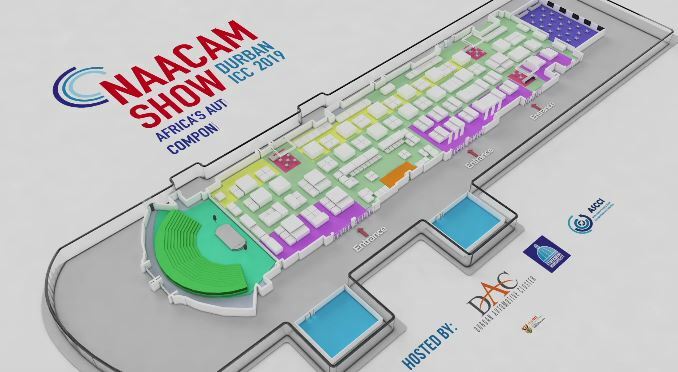 African Delegations: To support regional growth and intra-Africa trade in automotive manufacturing, the NAACAM Show 2019 intends to host delegations of component manufacturers from Nigeria, Kenya and Ghana. Delegates will be able to explore export market opportunities that could drive their business expansion into Africa. Firms currently supplying the automotive sector, or those that aspire to do so, are strongly encouraged to participate in the NAACAM Show 2019. To find out more about the participation options available to your firm, please get in touch with the Project Management team at info@naacmshow.co.za, or 031 764 6100.